When your air conditioner completely stops working, it’s obvious that it needs repair. But there are some more subtle signs that you need HVAC service in Burlington. These signs may be less noticeable, but catching them early can mean the difference between an easy repair and complete system replacement. Be on the lookout for the three “U”s of HVAC symptoms. Unusual Noises. Is your AC making more noise than usual? Do you hear rattling or banging? It could be that something is loose and interfering with the fan or causing the outdoor unit to vibrate on the surface it’s sitting on. Do you hear the system turn on and off repeatedly? That can be a sign of a variety of problems. Do you hear the whir of electricity as the system attempts to start up but fails to get going? It could be an electrical or other related problem. The bottom line is this: if you hear anything unusual related to your HVAC system, it may be time for service. Unpleasant Odors. If you notice an unusual smell and it seems to be coming from your vents, you may have a problem. First of all, what kind of a smell is it? A musty odor could indicate mold or mildew growing in your system or ducts due to excess moisture from a drainage issue or other problem. A burning smell could mean an electrical issue or friction from parts rubbing together that shouldn’t be. Any number of odd smells can be generated from a poorly operating air conditioner. Contact Alamance Oil, your HVAC service in Burlington, to get to the source of the smell. Uneven Cooling. Are you starting to notice that some rooms in your home are cooler than others? Of course, it’s normal for a dark basement room to feel cooler than an upstairs bedroom with the sun streaming through the windows. 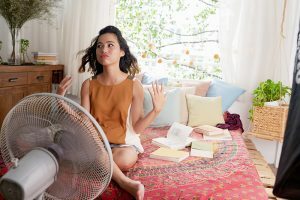 But when the temperature seems inconsistent throughout your home whether it’s day or night, it’s often a sign of a poorly functioning air conditioner. It may be an issue with insufficient airflow through the system. It’s possible the refrigerant is low due to a leak. It may even be that the system is too small for the size of the home it is trying to cool. Whatever the reason, uneven cooling is a sign that service is past due. Before any of these problems occur, you can prevent them with routine maintenance. HVAC systems need periodic service just like cars or any other working machine. Once you notice strange sounds or smells it may be too late for a quick fix. Instead, you’re looking at expensive repairs or possibly whole system replacement, which may have been prevented by having your system tuned up every year. Preventative maintenance is recommended by your HVAC service in Burlington to be scheduled once in the spring for your AC and once in the fall for your furnace. Sign up for a Comfort and Protection Service Agreement with Alamance Oil and your maintenance appointments will be automatically handled. Call (336) 226-9371 to keep your HVAC system running well throughout the year.